Growing your plants from seed is a bit like scratch cooking… if you have the right ingredients and follow the recipe meticulously, success will be yours! Additionally, sowing seed allows experienced gardeners and newbie gardeners alike to get the true feeling of the full growth process and really get immersed in growing your own garden. 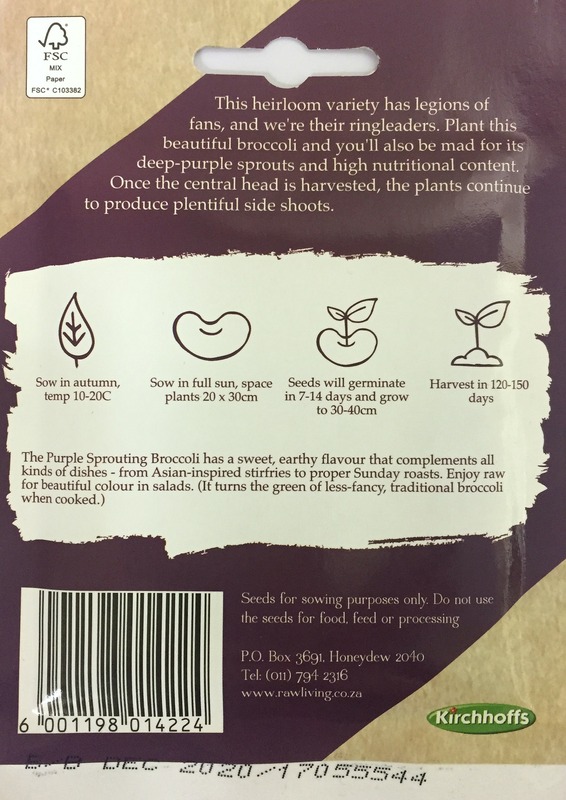 What follows is an explanation of the symbols on seed packets and how to apply these in practice when sowing seeds of your choice. 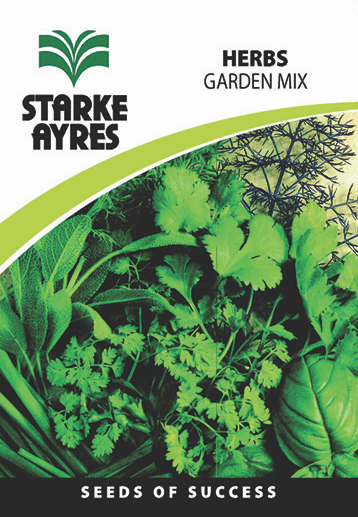 Lifestyle Home Garden stocks seed from Kirchhoffs, Mayford, Starke Ayres, Franchi Sementi and Raw (a Kirchhoff brand). These are all established and reputable suppliers of seed with a good germination rate which can be sown with confidence. These seeds have been saved and passed on for several generations. . They are open-pollinated and non-hybridized, so plants produced from them as well as seeds harvested from these plants will display most of the characteristics of the parent plant. The DNA of these seeds has not been genetically modified in any way. A blend of two or more varieties of the same plant or a blend of two or more different types of plants. If you live in an area that experiences moderate to heavy frost, seeds should be sown in the seasons indicated by the colour band for those areas. If you live in an area that experiences mild or no frost, seeds should be sown in the seasons indicated by the colour band for those areas. 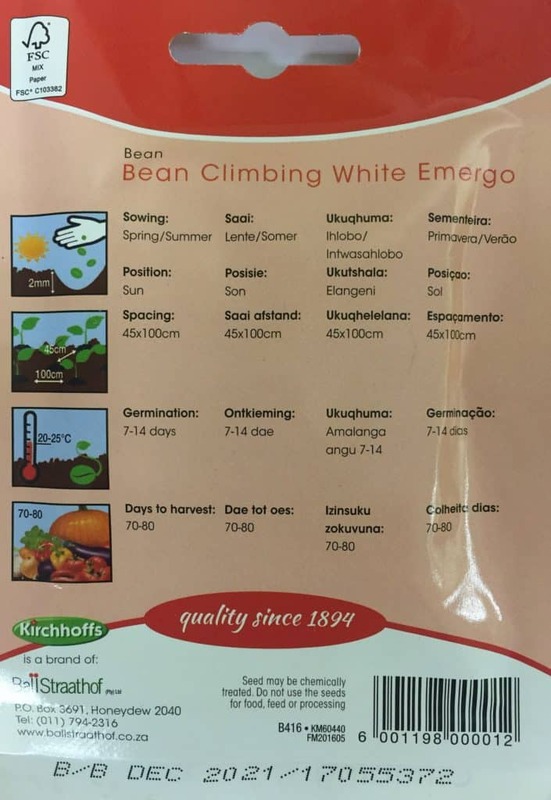 This indicates the ideal temperature or soil temperature for optimum germination. These seeds need to be sown in seed trays or plug trays from where they will be transplanted later when they are strong enough. Very important is the soil mix: it must be loose and friable to allow for good drainage, yet retain enough moisture for the seeds to germinate. You can either use a prepared Germination Mix or mix your own. A good mix is equal parts of a good topsoil, palm peat, perlite and Fertilis. Fill the trays with soil and level off. Compact it very lightly and spray to dampen the soil. Sprinkle the seed evenly over the top and cover with soil to the depth indicated on the packet. Water very gently with a fine spray and cover the seed trays with newspaper or black plastic for protection and to keep moisture in. Do not place in the hot sun at this stage. Water daily and check for germination. As soon as the seeds start to germinate, remove the paper and gradually expose it to more sunlight. These seeds need to be sown in specially prepared seedbeds from where they will be transplanted. Dig the soil over to a depth of about 15cm, remove all stones and clots and dig in a generous amount of compost and Fertilis. Dampen the soil. Sow the seeds in rows and cover with soil to the depth indicated on the packet. Water well with a fine spray and cover with straw or mulch to retain moisture. Thin out weaker seedlings to allow space for stronger ones to develop. These seeds are sown directly into the beds where they will grow to maturity. Prepare the soil properly as for the seedbeds. Don’t sow seeds too close together and thin out to the spacing indicated on the seed packet. This indicates the best position in which to either sow seeds directly or transplant your seedlings when they are ready. At least 6 hours of full sun per day. This can be either 6 hours in the morning, 6 hours in the afternoon or a bit of both. 2-4 hours of sun per day. Some plants prefer the early morning sun, but cannot stand the intense heat of the afternoon sun, while others can handle both. The dappled shade of a deciduous tree is also considered to be a semi-shaded position. This does not mean a complete lack of sun, but a position that receives less than 2 hours of sun per day. 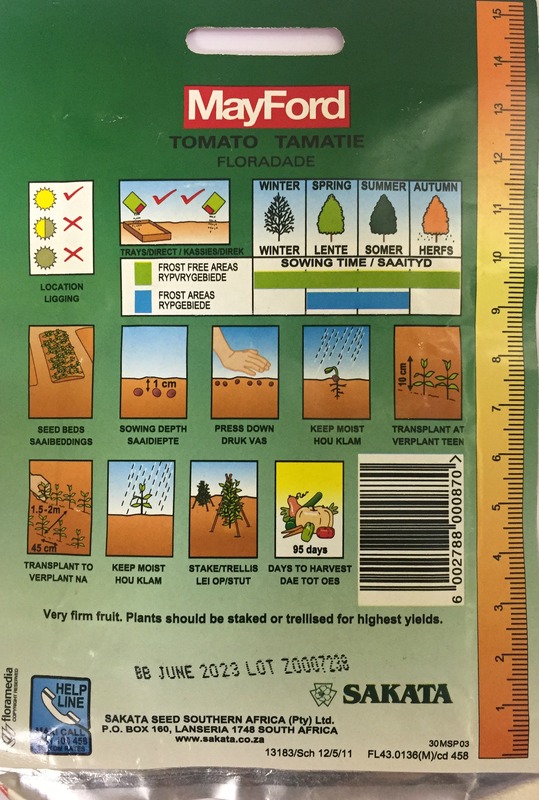 Some seed packets have a handy measure printed on the packet to assist with spacing seeds and seedlings. The depth at which the seeds must be sown, in other words the depth of the soil that must cover the seeds. If this is not indicated on the packet, the rule of thumb is to plant the seed at a depth of 2-3 times its length. This is the size at which the seedlings should be transplanted from the seed trays or seedbeds into their permanent positions. Generally this would be at the stage where the seedling has four true leaves. The distance at which seedlings should be transplanted into beds or the distance to which seedlings should be thinned out if planted directly. This will ensure that plants have adequate space to grow to maturity. 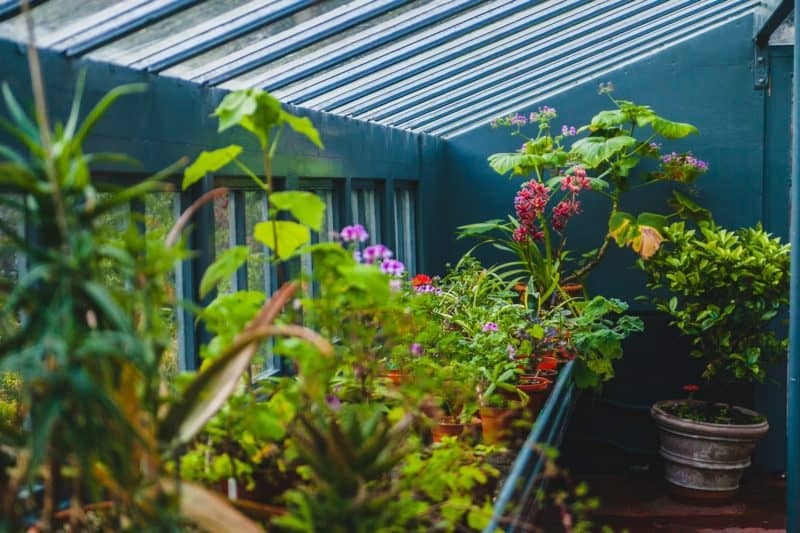 The distance to allow between rows of plants when transplanting or sowing to allow for adequate growing space as well as space to move around the plants when watering and weeding. If this spacing is indicated as e.g. 60 x 40cm, the first numeral indicates distance between plants (60cm) and the latter indicates distance between rows (40cm). The mature height the plant will reach. 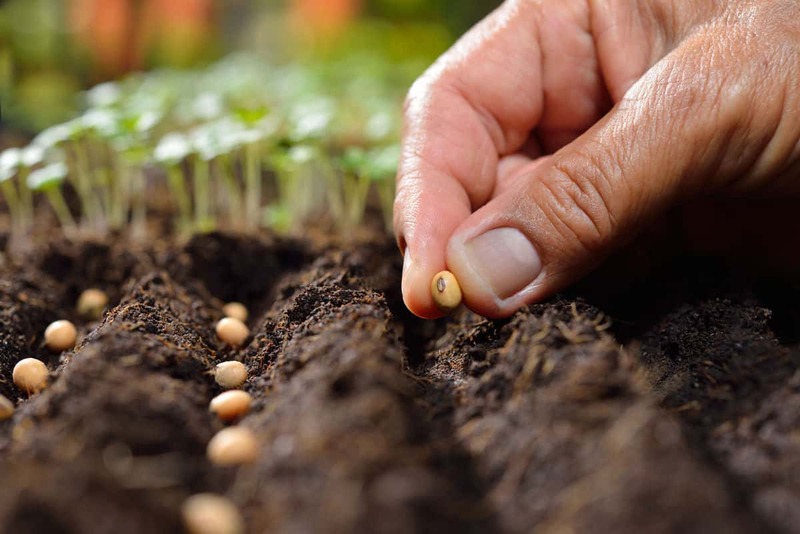 The estimated time it should take from sowing the seed until the first signs of germination appear above ground. The estimated amount of time it should take from sowing the seed until you can pick your first crop. The estimated amount of time it should take from sowing the flower seeds until the plant will start producing flowers. If you plant these suggested plants close to or between this specific plant, they will promote healthy growth and assist in keeping it pest free. Use the seed packet as a guide to assist you in sowing seeds – be it edible or flowering plants – the seed packet has the information that you need to grow seeds successfully. If you have never done it before and don’t know where to start, begin with herbs and veggies that you like to eat and cook with and look for seasonally available varieties that suit your taste. This way you are growing something for your own enjoyment! Obviously for those people who prefer instant gratification, there are always ready to pick seedlings and plants available; so do not fear if seed sowing does not appeal to you – everyone can have their own edible and flowering garden, it just depends on the process you choose to create it!